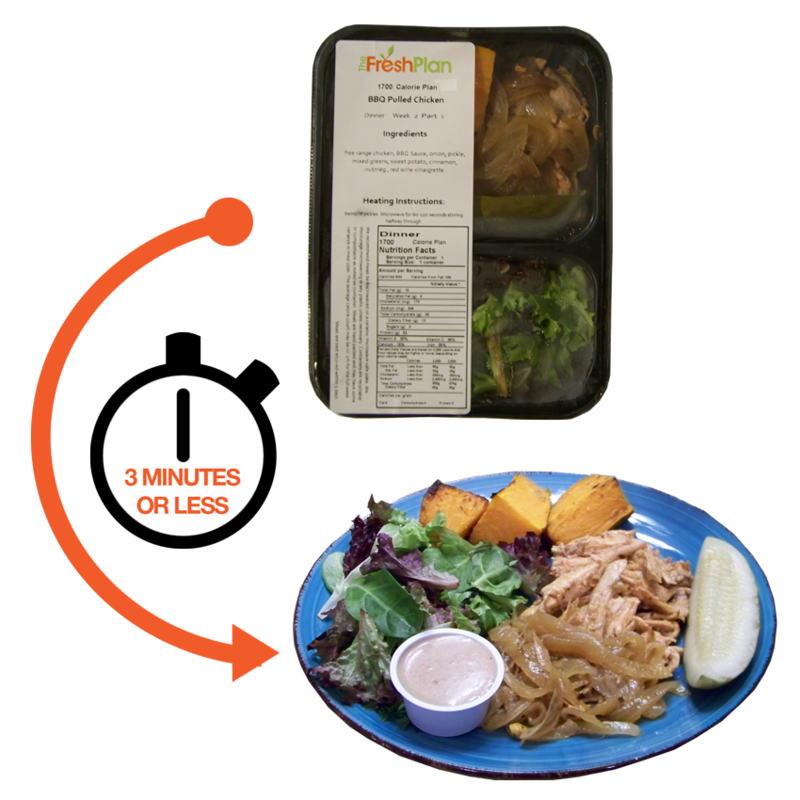 Fully Prepared, Calorie Controlled, Fresh Healthy Meals from container to plate in 3 minutes or less. Delivered right to your home or office or pick up at a convenient location. Fully prepared meals are fresh, never frozen. Just heat and serve. No more planning, shopping or cooking! Great for Seniors, Empty Nesters, Singles or anyone! The Fresh Plan healthy eating meal program consists of fully prepared meals to just heat & eat! All our meals are made in our commercial kitchen in Chicago. We only use the freshest ingredients available with no artificial flavors or ingredients and no preservatives. Our meals have no GMO’s or hydrogenated oils. Our chicken and turkey are pasture grazed, free range and antibiotic free. We use locally sourced ingredients when available. As a kitchen we recycle and compost to be as environmentally conscious as possible. The meal plan is calorie controlled, low sodium, low cholesterol, low fat, low in sugar and high in taste! With The Fresh Plan just HEAT. EAT. LIVE HEALTHY! If you have any questions, give us a call or chat with Betsy Now! The Fresh Plan meal program consists of fully prepared calorie controlled meals to just heat & eat! All of the meals are made with the freshest ingredients, no artificial flavors or ingredients, and no preservatives. Our chicken and turkey are free range, pasture grazed, antibiotic fee and locally sourced. The meal plan is calorie controlled, low sodium, low fat, low in sugar and high in taste! There are four different weekly menus that rotate each week so that if you stay on the plan for an extended period of time you won’t have the same meal until your fifth week. We pride ourselves in our extensive healthy menu with an array of different meals. The menus change to highlight certain ingredients when they are in their high season or even meals to reflect holidays or events during the year. There are NO contracts to sign! You only order week to week. If one week isn’t ideal for you then you can skip that week and start again when it is more convenient. We offer weekday and weekend plans to accommodate your busy schedule. Please let your chef & kitchen staff know that the food is really, really good, I've loved everything! While it has been somewhat hard cutting my calories, having such delicious meals, with such variety, makes eating enjoyable and I feel quite full after each meal. Just wanted to let you know! Since Duxler has been offering these meals, it has helped take our company's culture to the next level. It has also enabled my employees to further believe in and support the culture vision that I am constantly working to improve. Not to mention, they love the meals and it enables my team to eat nutritious, clean, healthy food throughout the day. My life, weight, health and attitude have drastically changed in the last 8 months since using The Fresh Plan with the fabulous support of Betsy and Scott. Using The Fresh Plan program I have lost 154 pounds with their delicious healthy meal plan. I feel like I was given a second chance in life. I have beaten my diabetes type 2 and my high blood pressure as well. NO more pills…yahoo!!! Are you trying to lose weight with no success? We get it. Cooking at home does not automatically guarantee a weight loss friendly meal. No matter how hard I’ve tried, I’ve never been able to maintain a New Year’s resolution.